Equipe launches its new architecture G10 Image Generator. Based on the latest commercial graphics technology, the new Europa model of the popular G10 system supports a 64-bit architecture for increased graphics rendering opportunities, higher resolution textures and larger area databases. 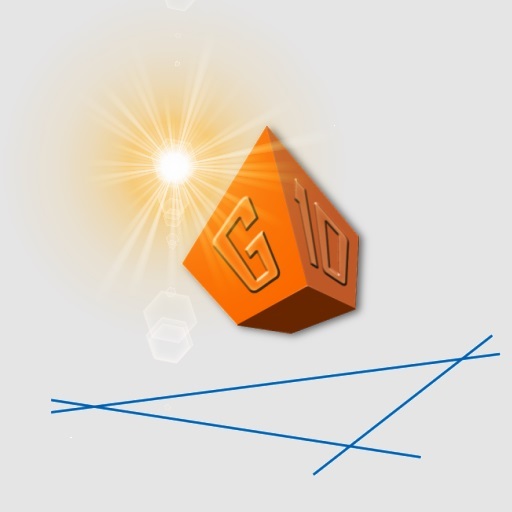 G10 Europa with Equipe Blue Sky Realtime Software meets the high demands of modern synthetic training requirements for military and commercial applications. With proven compliance to FAA Level D specifications and feature rich software, Equipe G10 Image Generators deliver both performance and quality for high fidelity training. 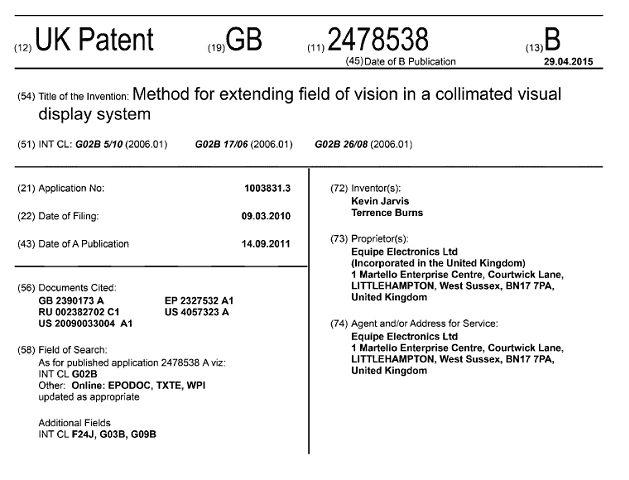 A Three Join Film Collimator Patent is awarded for extending the field of view of 60 degree+ collimated displays. Conventional 60 degree or more vertical field collimators have been limited in horizontal field of view at the lower outside corners by the width of the film. 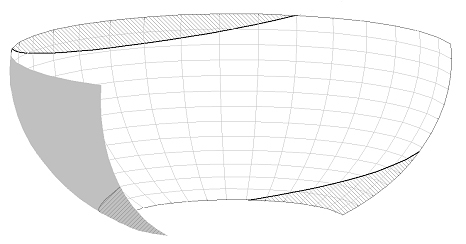 60 degree mirrors with 200 degree FOV or more by the loss of the outer lower corners of the visible field of view. As horizontal field-of-view increases to 220 degrees or beyond, then little increase in visible image width is achieved. After testing and field trials, Equipe have developed an innovative method of effectively increasing the film width by means of a third join placed inconspicuously in the unused upper part of the film, known as the dead band. The extra width allows an additional 15-20 degrees of horizontal width because the corner joins are lowered by the same width as the added film. This extends the useful horizontal view limit of a 60 degree collimator from typically 220 degrees up to 240 degrees. A patent was awarded in 2011 to eliminate the reflections inside collimators caused by the use of digital projection on the inside shiny surface of a rear projection screen. This greatly eases projection layout design constraints and consequently improves the performance of the display system. Every fast jet pilot trained in the UK since the year 2000 has been trained and qualified using an Equipe Simulation visual system. This association started with the BAE Hawk T1 Synthetic Training Facility programme in the year 2000 with 2 Hawk Weapons and Tactics Dome Simulator Visual systems (HWTS) and was continued with Equipe being selected for the Hawk T2 United Kingdom Military Flying Training Systems (UK MFTS) by CAE/Lockheed. Which again consisted of 2 Dome Simulator Visual Systems. 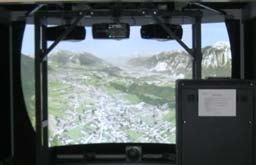 This latest Equipe designed display is now used as the benchmark for all Hawk full mission simulators the world over and comprises circa 7 metre spatial front projected dome, up to 15 high resolution projectors and an Equipe unique fully automatic projector alignment and blending system. The result is a truly seamless display system covering full field of regard with realistic eye relief. True 6 ft Lamberts light level provides ample light levels in the cockpit to read charts without the aid of additional artificial cockpit lighting. 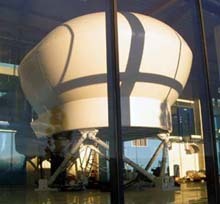 The domes are fully light sealed for Night Vision Equipment use within the simulator cockpit. Equipe 'True Night' optical blending is used to ensure the high daylight brightness levels achievable with halogen lighting is compatible with NVG operation. 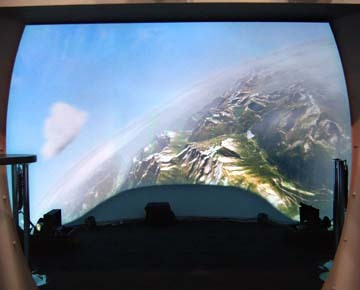 A HUD display is projected using a proprietary filter system that also maintains NVG compatibility whilst providing high brightness and resolution. The Auto-alignment system performs a complete check and correction cycle in minimal time allowing daily alignments for optimum performance at all times, thus requiring very low periodic maintenance. Equipe has ex-demonstration screens available for purchase. 120 x 60 and 150 x 40, click here for details. Enquiries to sales@equipe-electronics.com. Under the provision of the 6th Framework Programme by the European Commission Directorate-General for Energy and Transport, Equipe partners with Saab AB and the LFV Group to successfully deliver a targeted research project analysing the cost and benefits of performing ATC services from a remotely operated tower. The Project's goals, to progress the development of technologies, processes and procedures in Air Traffic Management, are aligned with the objectives of the SESAR (Single European Sky ATM Research) Joint Undertaking, who have issued an award in recognition of the performance achieved. The concept of the remotely operated tower places cameras and sensors at the airfield, which transmit a real time view to the central management control where it is projected in a 360° view, enabling the air traffic controller to manage and control the operation of the airfield from a remote location. Equipe designed and supplied a 360° display that presents a seamless, uninterrupted view of the transmitted scene. 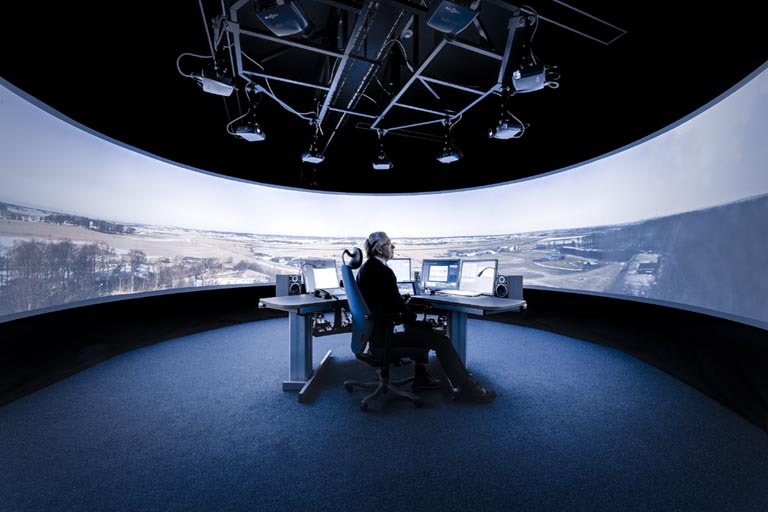 An Equipe Horizon Display Screen and Nine Equipe Contour Series DLP projectors provide the immersive environment for the air traffic controller. The Equipe ProMap Geometry, Edge Blending and Colour Correction system processes and manages the raw image from the live camera feeds to deliver a corrected image, blended and colour matched for total uniformity. If you missed I/ITSEC or would like to view the 'monitor friendly' version of this demonstration please click here for your choice of high or low bandwidth downloads. We wish you all very Happy Holidays and a prosperous New Year, and look forward to meeting you in 2011. 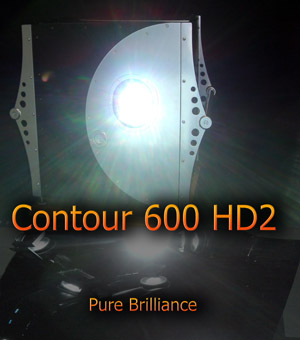 Equipe are proud to announce the next generation of Contour DLP projectors; the super hi-fidelity Contour 650 WQXGA. WQXGA (Wide Quad eXtended Graphics Array) is a display resolution of 2560x1600 pixels with a 16:10 aspect ratio. The name comes from the fact that it is a wide version of QXGA, which in turn has four times as many pixels as an XGA display. Displaying in excess of 4 million pixels, WQXGA offers 33% more pixels than today's LCOS QXGA projectors. 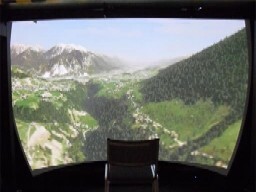 Equipe Simulation are pleased to announce our selection to supply two high-resolution dome visual display systems, utilising a multi-channel array of Equipe ContourTM series DLP projectors, in support of the UKMFTS Hawk T-2 AJT simulators to be located at RAF Valley. Earlier this year, CAE was selected to develop two Hawk T-2 full-mission simulators as part of the new Hawk T-2 ground-based training system. These new systems will augment the existing Hawk MK 1 simulators currently in use, as supplied by Equipe Simulation in 2000, and will provide greater fields of view at significantly higher resolutions. Managing Director Terry Burns stated, "We are very pleased to have been awarded this contract and look forward to working with our partners CAE and Lockheed Martin to provide a high fidelity visual display system that will deliver enhanced training benefits for the latest UK training aircraft." Equipe will work together with CAE and Ascent Flight Training, which is a 50/50 joint venture between Lockheed Martin and VT Group. Ascent is the Ministry of Defence's Training System Partner for the 25 year delivery of the UKMFTS programme. UKMFTS will replace the present flying training arrangements for the Royal Navy, the Royal Air Force and the Army Air Corps. It will cater for the different training needs of all UK military air crew: from the training of fast-jet, rotary wing and multi-engine pilots, to rear crew. Equipe is an innovative technological company and leading supplier of Visual Systems to the simulation industry for military and civil training and research applications. Equipe has offices operating in Europe and North America and is able to support all requirements of visual applications, from subsystem supply through to turnkey systems that are designed for compliance with customer specifications. Equipe has a comprehensive portfolio of visual system products and has extensive experience in the design, installation and integration of high performance solutions. Equipe's Continental Database (CDB) expands the concept of flight simulation visual training environments from current networks of local airport regions to continental sized areas containing the entire set of operational airfields set within a high detailed geo-specific terrain and cultural landscape. This is made possible through Equipe's Equater™ CDB automatic modelling tools capable of incorporating very large data sets of detailed digital airfield information. 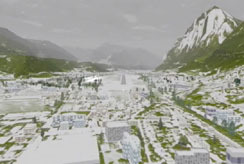 Equipe have developed the tools and processes to update and keep current continental sized simulation environments at regular intervals with an ever growing richness of environmental data whilst integrating fully with the specified visual training features deployed on the most sophisticated training systems. Equipe offer sincere congratulations to our partners AXIS Simulation for obtaining JAA Level D certification on their latest full flight simulator. Utilising our C-Series collimated display, G-10 IG, ProMap and Contour projectors the success of AXIS underlines Equipe's DLP based collimated visual displays as the premier solution for high fidelity professional simulation. Congratulations AXIS, all at Equipe look forward to working with you on your future systems. Equipe once again attended the World Airline Training Symposium (WATS) in Orlando, this year demonstrating our unique 'Continental Database' with both North American and European options. As last year, Equipe wish to thank all that attended for making this event such a success. Underscoring our position as the premier visual system provider, we are proud to announce the launch of ProMap Auto, the worlds most advanced automatic calibration system. 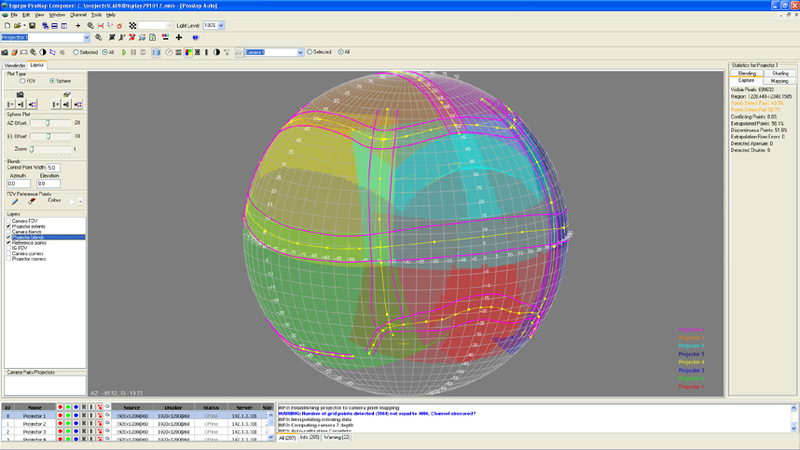 Unlike other systems, ProMap Auto provides complete calibration and setup of Geometry, Colour and Brightness. For more information on ProMap Auto Click here. At I/ITSEC 07 Equipe were proud to demonstrate the brightest and most resolute multi-channel display at the show, providing 100 foot lamberts at <2 arc minutes per pixel and demonstrating once again Equipe's ability to design and manufacture leading edge visual solutions. Also on display for the first time was our leading edge digital projector, the Contour 600, providing TXGA resolution and underpinning Equipe as the visual solution provider of choice for all simulation applications. We would like to thank all of you who visited our stand for making it both a successful and memorable show and look forward to working with all our customers in 2008 both new and old. To save the demo video to your hard disk, right-click a link and select 'Save as'. Adding to Equipe's global presence, the new U.S. Division will directly service all simulation requirements, both civil and military, within the USA and the Americas, and offers Sales, Design and Customer Support services. 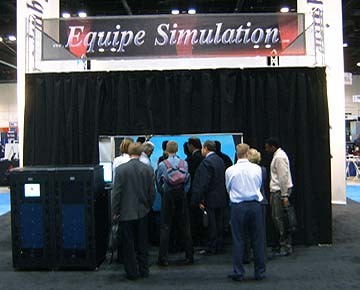 Equipe USA may be contacted directly at..
Once again Equipe Simulation exhibited at I/ITSEC in December, and would like to thank everyone who attended for making it our most successful show to date, and hope that you all enjoyed our new state-of-the-art demonstration shown within the largest full dome at the show. If you missed I/ITSEC or would like to view the 'monitor friendly' vision of this demonstration please click here for your choice of high or low bandwidth downloads. As the year progresses, Equipe will be attending ITEC in Cologne between 24th and 26th April 2007 where we can be found on booth 126, and for our civilian customers, the World Airline Training Show, WATS, in Orlando USA between 12th and 14th June 2007 where we can be found on booth 404. We wish you all a very Happy and Successful New Year and look forward to meeting you during the coming year.